Eighteen-year-old Manga, hailing from a nondescript village in Pedabayalu mandal, had never set foot beyond the verdant hills of the Visakha Agency. As part of a 30-member 11th Tribal Youth Exchange Programme, Manga ventured out of the cool confines of her village for the first time to experience the world beyond her hills, and was floored by the hospitality that she received in the northern town of Panchkula in Haryana. Like Manga, it was an experience of a lifetime for the rest of the group, as it was for the first time that they travelled by train or rode in a cab. Jagapathi Naidu, from an interior village in G. Madugula, even picked up a few words in Hindi, that too in the Haryanvi accent, and a few lines from popular songs of Haryana’s singing sensation Sapna Choudhary. Interacting with The Hindu here on Friday at the 198 CRPF Battalion campus, the tribal youth enthusiastically narrated their experiences. Bhavitha Kumari from Munchingput, who is also training in general nursing, sang the patriotic song ‘Hind Desh ke Niwasi’. She stood second in the singing competition at the exchange programme. “Though we had problems with the food, we quickly adjusted and made a lot of friends. The weather at Panchkula was also chilly, but we are used to similar weather back home during this part of the year,” Bhavitha said. The programme was organised by CRPF and Nehru Yuva Kendra Sanghatan — Visakhapatnam. According G. Chandana of NYKS, about 30 tribal youth including 15 girls were selected to undergo the programme. 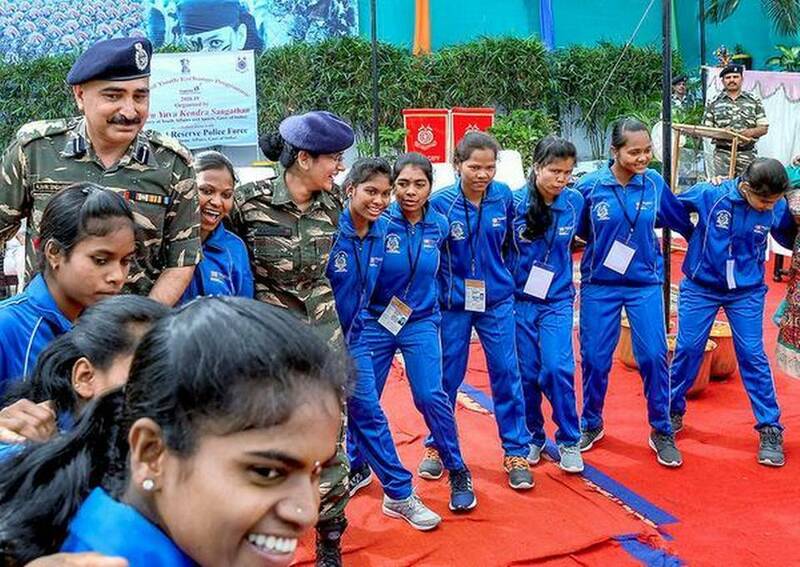 “Five 30-member teams from Visakhapatnam in AP, Khammam in Telangana and teams from Chattisgarh, Maharashtra and Bihar, were part of the programme,” she said. Commandant of 198 Battalion K. S. Deswal said the youth were selected based on their interest in being part of a cultural exchange programme. “Most of them were picked up from interior villages in AOB region, where there is considerable Maoist influence. The idea is to give the youths an exposure to a different world,” said Mr. Deswal. The team visited Panchkula from January 23 to 29 and apart from sightseeing, were exposed to classroom sessions where they were briefed about various welfare schemes and scholarships offered by the Central Government. All the teams were selected from LWE-affected districts.